With the Hopper’s exclusive feature, PrimeTime Anytime™, three hours of primetime programming are available to you for up to 8 days from initial air date. Plus you can save your favorite primetime content forever. You can also instantly skip commercials in primetime TV on ABC, CBS, FOX and NBC. Hate commercials? DISH created commercial-free TV so you can save an hour each night*! Now you can instantly skip commercials in recorded primetime TV. Only DISH gives you ad-free TV with the Hopper™. Record up to 6 Channels at Once with PrimeTime Anytime™. – Record up to six live channels at once during primetime, including your 4 local networks and 2 channels of your choosing, and stream four recorded programs to different TVs simultaneously. That means you can watch more and miss less of your favorite programs. Massive 2 TB Hard Drive. – DISH believes you should be able to control how, when and where you watch TV. That’s why the Hopper™ includes features like PrimeTime Anytime—which lets you automatically record your favorite primetime shows so you can watch them on your own schedule. 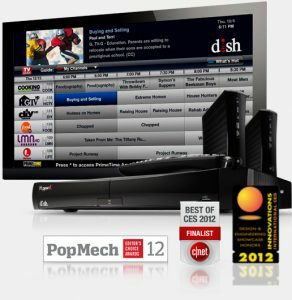 DISH’s Hopper Whole-Home HD DVR is the most advanced in the industry. DIRECTV’s Genie doesn’t even compare. Previous Previous post: Compunet’s Internet Now Offering 15 mbps Download Speeds!